On Friday we had Someone Special Day. We did this last year for the first time and it was a huge success, so we had it again and it was wonderful. This year it was a little different. First, on Wednesday we celebrated the birthday of good ole Johnny Appleseed. Each child brought a peeled apple to school. The children cut up the apples, we put them in a crock pot, and let it cook for a while--applesauce! Now this applesauce was for a special occasion of course. We used it for snack on Friday, when our someone special came. This day consisted of each child bringing someone special to school with them. We had grandparents, aunts, dads, moms, and even family friends. We had a packed house. We spent all day doing our school activities with our special someone. We had opening, skill time, then it was craft and free play time. For craft I split up different duties. I had some families make flowers for our tables, some punch, some cut up cheese squares for snack, and some put pepperoni slices and crackers on trays. After this it was hand washing and snack time. For snack we had all the great things we prepared during free time plus we had vanilla ice cream with warm applesauce on top--DELICIOUS! Our final activity was a new one and one I loved. In my recent Mailbox magazine they had an activity that fit out day wonderfully. It was to create a book. 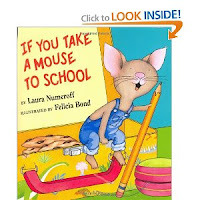 The activity included reading the story, "If You Take a Mouse to School," by Laura Numeroff. Then I had all the families take a piece of paper and write, "When you take ......to school.....you......." Then everyone drew pictures. I love the pictures and sayings they all came up with. We are going to take all the pictures and create a book to share with the whole class. It was a wonderful day and a tradition I would love to continue.